Section 14 was a section of the docks on the mainland portion of New Mombasa, Africa, on Earth. The section's harbor traffic was monitored during the daytime, but not during the night, thus transforming the shoreline of industrialized regions of New Mombasa into some of the most "notorious hangouts" for criminals after the sun sets. Section 14 was the primary monitoring outpost of port traffic for Nyali, Tudor Creek, and New Mombasa island. By the time of the Battle of Mombasa, the area was home to a construction site, which was abandoned following the arrival of the Covenant. The site would go on to be used as a War Games scenario. 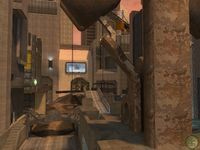 Section 14 is the location of the Halo 2 multiplayer map Headlong. The map's Halo: Anniversary remake, Breakneck, is set in a structurally near-identical, yet separate sector, identified as Section 21. Section 21 is both a nod to Section 14 and a 7 reference, as 14 and 21 are consecutive multiples of 7.